Some people have a bad day in court, or a bad week in court. Thus far, Donald Trump has had a pretty bad two-and-a-half years in court. According to a new analysis from the Washington Post, federal judges have ruled against the administration 63 times, an unprecedented number of setbacks for a chief executive, particularly one barely halfway through his first term. The courts have been pretty well stacked with judges favorable to Republicans in general, and to Trump in particular, but the administration has nonetheless been getting adverse rulings from the appointees of both parties. 45 of the 63 rulings came from judges chosen by Democratic presidents, while the other 18 came from judges chosen by Republicans. It has also been true that when multiple judges, appointed by presidents of different parties, ruled on an issue (say, DACA), they've often come to the same legal conclusions. The main problem, cited in fully two thirds of the adverse rulings, is the slapdash quality of much of what the administration does. The Administrative Procedure Act (APA) was adopted in 1946; its purpose was to make certain that the policy initiatives of the executive branch are implemented thoughtfully and carefully, and are not arbitrary. On average, when a presidential administration is accused of running afoul of the APA, they prevail about 70% of the time. The Trump administration's success rate in such cases, so far, is a paltry 6%. Also not helping things is a president who shoots himself (and his lawyers) in the foot on a regular basis. A dozen of the 63 adversarial rulings were based, at least in part, on Trump's ill-advised public statements or his tweets. In particular, several judges cited his "sh**hole countries" remark in determining that various administration initiatives had discriminatory intent. Many of Trump's allies and supporters, eager to take advantage of deregulation, are frustrated by the administration's lack of progress. Unfortunately for them, things are not too likely to change, because all of this is a product of the type of man and the type of politician that Trump is. There's his tendency to attract something less than "the best people" to work for him, of course. But beyond that, what he fundamentally cares about is attention and adulation. He has no particular commitment to most of the initiatives he pursues. For him, once he's made a big announcement, maybe with a signing ceremony, and then possibly added a few snarky comments on Twitter or in an appearance on Fox News, his goals have been fulfilled. There is little value to him in followthrough. In 1967, during the Six Day War, Israel occupied the Golan Heights, an approximately 700-square mile piece of territory (about half the size of Rhode Island) in western Syria. In 1981, the Israelis de facto annexed the territory, although the United Nations pointedly refused to recognize the move. That is pretty much where things stand today, with the Heights under Israeli control, but the international legality of the situation in question. On Thursday, Donald Trump declared that the time has come to eliminate all ambiguity, and for the international community to recognize Israel's ownership of the disputed area. The President's motivation here is plain: Israeli prime minister Benjamin Netanyahu is facing a tough reelection next month, and is doing poorly in the polls due to both his leadership and his indictment on corruption charges. So, he pushed hard for Trump to give him a shot in the arm by calling for recognition. Later in the day on Thursday, Trump insisted that is not what is going on, and that his announcement was merely coincidental. Given that he's on pace to tell his 10,000th lie right around June 1 of this year, we can confidently dismiss his denial. Can it properly be called a "feud" if one of the two sides is not participating by virtue of having been dead for six months? Maybe, maybe not, but whatever it is, it kept going on Thursday. For the fifth day in the last six, the President laid into the former Arizona senator, calling him "horrible" and reiterating that he should never have brought his concerns about Trump to the FBI's attention. At this point, Trump's pettiness and his willingness to put score-settling and his own hurt feelings above...well, pretty much everything else, are well known. The most interesting dimension to this story might actually be the response of Sen. Lindsey Graham (R-SC), who was ostensibly McCain's closest friend in the Senate, and was once a staunch critic of the President. The Senator has hugged Trump close in recent months, of course, and during the recent spate of attacks on McCain, has been noticeably passive in defending his one-time friend. One might consider such behavior to be disloyal, spineless, and unprincipled, which would be far from the first time that Graham has been described with those words. However, the Senator's political instincts are, as usual, dead on. When he was criticizing Trump, his approval rating back home was middling, particularly among Republicans. A new poll from Winthrop makes clear that while Graham is still doing poorly with Democrats, he's now got a nearly 75% approval rating among Republicans. In ruby red South Carolina, that translates into no serious primary challenge, and then an easy re-election, in 2020. That didn't take long. Just 72 hours after the mosque attacks that took 50 lives, New Zealand's Prime Minister Jacinda Ardern announced that the nation will ban all "military-style" assault weapons by mid-April. Money will be set aside to compensate folks who voluntarily surrender their guns, and steps will also be taken to see that people cannot stock up on illegal guns before the ban takes effect. Reportedly, the vote in New Zealand's parliament was 119-1. This has, not surprisingly, led to the publication of a great many articles like this one, contrasting the speedy actions of the New Zealanders with the United States' inability to do much of anything on this issue. Of course, that is somewhat comparing apples to oranges, since New Zealand has a parliamentary system, which is very well situated for quick decision-making, while the U.S. has a divided government (not to mention the Senate filibuster, and a Supreme Court with an awful lot of power and a consistent love of the 2nd Amendment). Still, there are signs that America's current gun gridlock may not hold all that much longer. Polls make clear that the voting public's enthusiasm for the current "Wild West" approach to guns is waning. The Parkland shootings, in particular, appear to have been a transformative event. Further, as The Atlantic's Peter Beinart points out, conservatives approached gun ownership as a cultural issue, linked to free speech and religious freedom and the sanctity of marriage, and so forth, rather than as a public policy issue. And as the culture wars fade in intensity, mostly due to the deaths of the older, white voters they were created for, the whole house of cards could collapse, taking gun ownership with it. The NRA isn't the only pillar of American conservatism that may look quite different in the near future. Fox News is in a time of transition, and once the dust settles, it's not clear what it might look like, or exactly how Donald Trump-friendly it will remain. The most important development here has to do with the Fox Corporation, the Rupert Murdoch-owned company that includes Fox News as part of its portfolio. Many of Fox's media properties (the film and television divisions, in particular) were just sold to Disney. The remainder, including Fox News, are now under the leadership of Rupert's son Lachlan. Lachlan is a libertarian conservative (think: Koch brothers) and has been openly critical of the President. Further, his primary concern is the financial health of the channel, which might also be sold off in the near future. He is worried that its reputation as a Trump propaganda machine could hurt its value and its profitability. Consequently, the young Murdoch has made a few moves in the last week that were decidedly not pro-Trump, appointing former Speaker Paul Ryan to the Fox Corp. board, and hiring former DNC chair Donna Brazile as a commentator. Reportedly, Lachlan has been treading somewhat lightly and waiting until the deal with Disney was formally closed, for fear that there might be some last-minute, Trump-ordered federal government interference. However, since the closing date was March 20 (i.e., Wednesday), that obstacle has been removed and it's full steam ahead for whatever Murdoch is planning. Meanwhile, there is also a fair bit of tension within the halls of Fox News. Jeanine Pirro remains suspended due to her anti-Muslim remarks, and with many advertisers making clear they're done with her, she may never be un-suspended. Tucker Carlson is in some hot water for past offensive statements that have been dragged up from his appearances on a shock radio program. The news division is unhappy, believing that the opinion division has damaged the reputations of everyone who works there. And Sean Hannity, who has been the face of the network since Bill O'Reilly got canned, is unhappy. He thinks Fox is not pro-Trump enough, is angry about the firing of Roger Ailes and former Hannity producer Bill Shine, and thinks the whole Murdoch family has turned traitor. The outspoken pundit has told friends he's leaving when his contract is up in early 2021, and while that could be just a negotiating ploy, Lachlan Murdoch (or the new owner of Fox, if it comes to that) may be happy to show him the door, given his penchant for attracting controversy, and the fact that his demo gets older and less advertiser-friendly by the day. Now that the Democratic field has more than a dozen candidates, it's time for the reporters to roll up their sleeves and get to work. And so they have, digging up all sorts of dirt on the various folks who are running. In just the last week, there have been revelations about Beto O'Rourke's teenage hacking, Sen. Bernie Sanders' (I-VT) three houses, Sen. Cory Booker's (D-NJ) secret meetings with Jared Kushner's felonious father, and Sen. Kirsten Gillibrand's (D-NY) clumsy handling of sexual misconduct by one of her staff members. The latest candidate to come under the microscope is Sen. Amy Klobuchar (DFL-MN). Before her congressional career, she served as County Attorney of Hennepin County for 8 years. And, as the Washington Post reports, she had a record that probably pleased the voters of the 81% white county, but that may not go over well with some parts of the Democratic base in 2020. In particular, she declined to pursue charges in more than two dozen cases where people were killed in encounters with the police, while at the same time she vigorously prosecuted relatively minor offenses like vandalism and marijuana possession. The overall result of her decisions was to deny full hearings to families of color whose loved ones died at the hands of police, while also disproportionately incarcerating minority citizens. Note that it wasn't our idea to call him Fredo; it's a name used by Trump campaign insiders to refer to Donald Trump Jr.'s perceived lack of acumen in business, politics, or much of anything else, thus leaving him to ride on dad's coattails, just as Fredo Corleone did in the Godfather movies. In any case, it does not appear that Fredo...er, Don Jr. has gotten the message that he's better off keeping his mouth shut, because in an op-ed published by the right-wing newspaper The Telegraph, he presumed to tell the Brits that the Brexit would have been a piece of cake if they had just listened to his father's advice. A bit of skepticism is warranted here, to say the least. Like her or not, Theresa May is a veteran politician and a shrewd cookie, and if she hasn't been able to figure it out, it's rather unlikely that a politically inexperienced Yank has some sort of magic solution in his pocket. Especially when that Yank has been unable to address any of the allegedly "easy" issues in his own country, like solving the opioid crisis, bringing peace to the Middle East, building a wall along the southern border, reducing the national debt, or replacing Obamacare. If one actually reads the op-ed, one's skepticism grows even further, since young Trump doesn't actually mention what the solution is, merely that it exists and it would have made things easy. That approach runs in the family, of course, as Trump Sr. has consistently neglected to describe exactly what his magic pills are for all the things he allegedly has magic pills for. In this particular case, however, we actually do know what the proposal was, because May spilled the beans several months back. It turns out that the President recommended the Trump family solution for all ills: a lawsuit. Specifically, he advised that the UK sue the EU. When the Prime Minister revealed this, she had trouble controlling her laughter. He's been on the to-do list for a while, and now that he's qualified for a seat at the Democratic debates, his turn is up. Background: Yang is a first-generation American, born in New York to Taiwanese immigrant parents who met in grad school at Berkeley. His father made extensive use of the scientific training he got at Cal, ultimately registering nearly 70 patents. His mother used her stats degree for a while, and then became an artist. Andrew, for his part, was educated at a number of elite prep schools, and then took a B.A. in economics from Brown and a J.D. from Columbia. Thereafter, he worked briefly as an attorney before helping to found or run a number of tech-based startups, many of them civic minded, like stargiving.com (fundraising from celebrities), Manhattan Prep (helping students prepare for standardized tests), and Venture for America (encouraging budding entrepreneurs, particularly in smaller cities and towns). Political Experience: Yang has held no full-time political office, either elected or appointed. The only things he has on his political resumé are several appointments to blue-ribbon political commissions, including being named a Presidential Ambassador for Global Entrepreneurship by the Obama administration. Signature Issue(s): There's no guesswork here. Yang has made very clear that his top priority is a universal basic income of $1,000 a month to every American over the age of 18. He calls this "The Freedom Dividend," and he argues, with some justification, that this is a necessary corrective to the rise of mass-automation, and would pay the costs of the program by taxing the corporations who have benefited most from said automation. He has also written a book on the subject. It is worth noting that he has a number of other policy positions that are somewhat unorthodox, and that are getting a fair bit of attention. He wants to make April 15 a holiday, called Revenue Day, in order to "make taxes fun." He wants to subsidize people who are willing to move from big cities to more rural communities. He wants to outlaw robocalls and force airlines to hold auctions for any seats they overbook. He wants to make it easier to add pork to bills, arguing that it makes it easier for those bills to get passed. And, he wants to redirect 10% of the military budget to infrastructure, to fund what he calls "The Legion of Builders and Destroyers." Instructive Quote: "I probably looked pretty conventionally successful as a 24-year-old getting paid $125,000 a year, plus bonus, wearing suits, and living in a Manhattan apartment. But I hated my job, I didn't admire the people I was working with, and I felt that I was becoming a smaller, less imaginative, less risk-taking, less likable version of myself." Completely Trivial Fact: Let's do this as an actual trivia question. If Yang, or Kamala Harris, was to be elected, either would be far and away the highest-ranking person of Asian descent in the history of the executive branch, and of the federal government. Whom would they supplant? Answer below. Recent News: In an event that nobody has been waiting for, Yang and conservative pundit Ben Shapiro announced this week that they will have a debate about the merits of circumcision, another of Yang's campaign planks. Shapiro, an orthodox Jew, will take the pro- position, and Yang will take the anti- position. Yang's strategy really ought to be to cut Shapiro off, very early. We will now summon all of our willpower and limit ourselves to just the one circumcision joke. 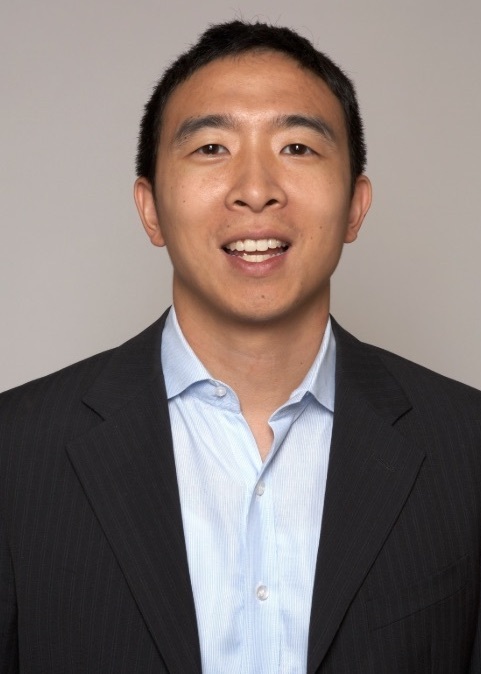 Three Biggest Pros: (1) Creativity will get you far in life, more so than many people realize, and Yang may be the most creative thinker in this year's field; (2) If the voters decide they want someone who will shake things up, Yang fits the ticket; and (3) He inspires the sort of devotion from followers that we don't see with too many other candidates this year (Bernie Sanders and Beto O'Rourke being the exceptions). Three Biggest Cons: (1) Being a year or two ahead, or a year or two behind, the public on the issues is a good place to be, but being 10-20 years ahead usually isn't; (2) Voters have generally been leery of candidates with no political experience, and the last four years may intensify that feeling; and (3) Donald Trump would have an absolute field day with the names, from "Robot Man" to "Yang likes Wangs." That sort of mockery shouldn't work, but it does. Is He Actually Running? : He certainly is. Betting Odds: He wasn't even on the board a month ago, now he's getting 20-to-1 to 12-to-1 at the books, implying a 5% to 9% chance at the nomination. That means he's now getting better odds than Elizabeth Warren, Cory Booker, Amy Klobuchar, or Kirsten Gillibrand, and reminds us that sometimes people bet from their hearts and not from their heads. Completely Trivial Answer: At the moment, the highest-ranking Asians in the history of the executive branch are Norman Mineta and Gary Locke, who both served as Secretary of Commerce, putting them 10th in the presidential line of succession. This is well ahead of former Secretary of Energy Steven Chu and former Secretary of Veterans Affairs Eric Shinseki. Current Secretary of Transportation/former Secretary of Labor Elaine Chao is not eligible to the presidency by virtue of being a naturalized citizen, and wouldn't have outranked that pair anyhow, while U.N. Ambassador Nikki Haley was a Cabinet-level officer, but not actually in the line of succession. The only person of Asian heritage to get within single digits in the line of succession is Daniel Inouye, who was 4th in line while serving as President Pro Tempore of the Senate from 2010-12. The Bottom Line: The bad news for Yang supporters is that no candidate like him has ever won the presidency, or even a major party nomination. The good news is that the same was true of Donald Trump in 2016. He's still a longshot, but that's better than a no-shot, which is how we would have described him three months ago. Mar19 What Is Going on With Steve King? Mar15 Could Omar Face Primary Challenge? Mar14 Why Did the Democrats Pick Milwaukee for Their Convention?